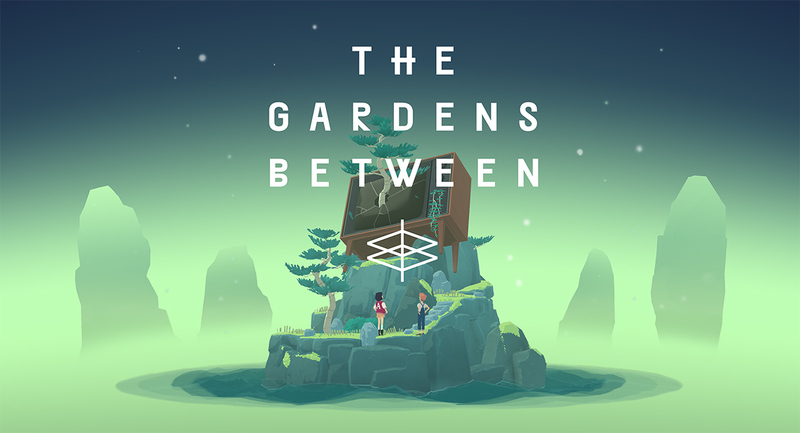 The Gardens Between is an innovative puzzle game where you control the flow of time in many different ways, using many different interesting game mechanics which come together to form this challenging but relaxing game. 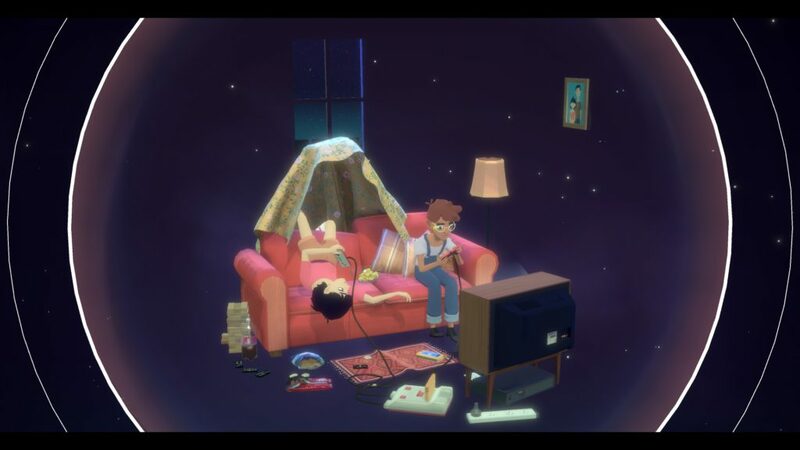 It tells a story about two friends growing up together, conveyed without dialogue but with beautiful graphics and a relaxing soundtrack. 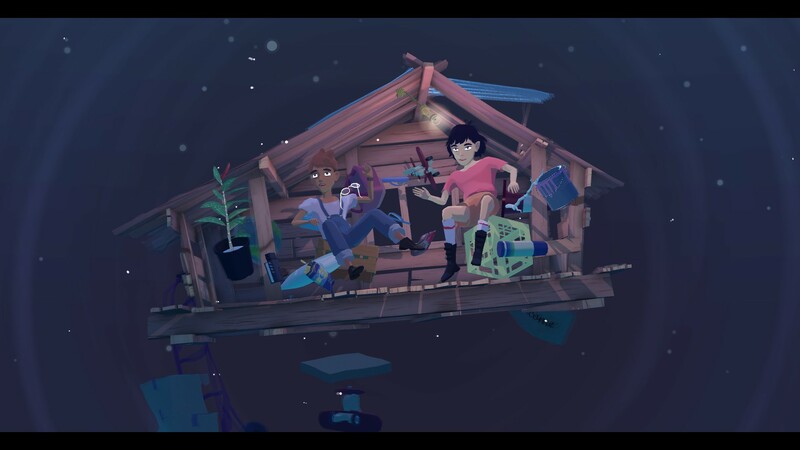 The Gardens Between has been developed and published by indie game studio The Voxel Agents. The story of The Gardens Between is told purely in context. In the animated introduction you’ll see two houses in a city, and two kids sitting in a treehouse at a playground. They are in a lighting storm, and suddenly a mysterious light appears before them. As they touch it, they are transported to a magical realm, where they travel between islands on a raft made of their tree house. 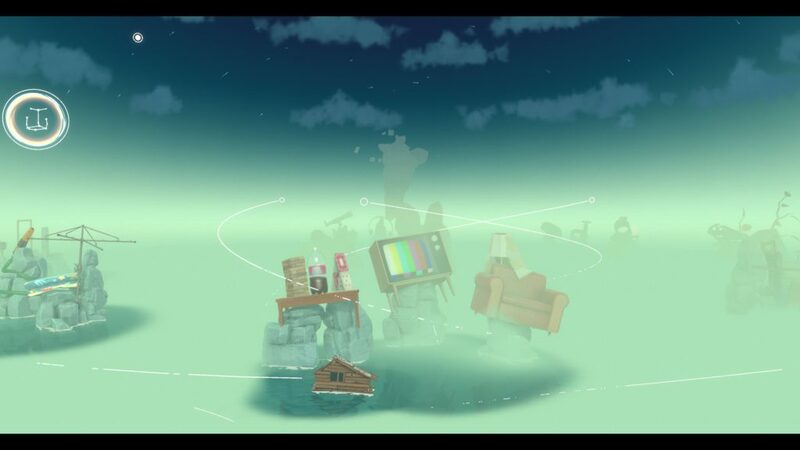 Each island contains random objects and moving boxes from their homes, but also strange objects like flowers which create the strange lights they saw before, and strange boxes which seem to be alive and jump around. Each island is part of a memory, and two or three islands combined form one memory you’ll witness when you’ve completed the puzzles on all those islands, and then you’ll move to the next group. As you puzzle your way through the islands, you’ll see the kids growing up together in their memories. It’s a very nice and interesting way to tell the backstory of the characters of the game. The graphics are nice, colorful and relaxing. The game has a dreamy atmosphere, which is conveyed well through both the graphics and the music. The islands you’ll puzzle your way over, all contain items from a memory of the two kids together, as they grow up. These are typically nostalgic items from kids games, like an inflatable bath, balloons, a couch fort, a VCR player, a game system, domino stones, things like that. These items seem randomly scattered around the islands, but the kids will interact with the items, choosing their path around and over them, and using the movement of these items to their advantage to proceed through the puzzle. The soundtrack of the game is very relaxing, which fits the dreamlike atmosphere of the game. Different islands have different music, and the title and menu screen all have different music as well. The game doesn’t have any dialogue, but it’s not at all needed for the game. The kids show their emotions as they wander around, sometimes curious, sometimes impatiently waiting for the other, which gives them personality but it’s not needed for the puzzles in any way. The memories and objects speak for themselves as you watch the memories come together, and enjoy the beautiful soundtrack. 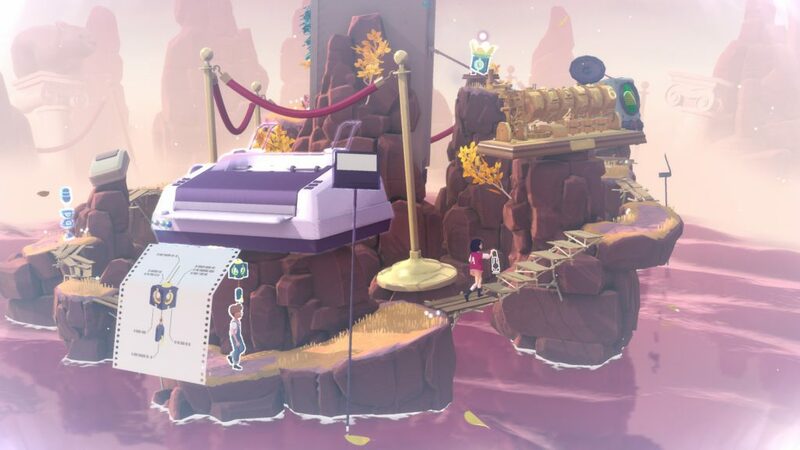 The Gardens Between is an innovative puzzle game where you control time. In order to continue to the next island, the kids have to solve the puzzle on the island they are on. The kids carry around a lantern, which needs to be lit with one of the strange balls of light the kids saw at the beginning of the game. These balls of light power all kinds of mechanisms you need to travel over the island, and a lit lantern is always needed at the very top of the island to travel to the next island. The balls of light are emitted by strange flowers, and can be collected in the lantern. Mechanisms are powered by boxes, which can carry the lantern around. However, the light can also be consumed by different flowers. As a player you don’t control the movement of the kids, you can only control the time and whether or not the kids interact with something. You can turn time back and forth, and by letting the kids interact with certain objects, you can change things in time. When certain objects are interacted with, the change will carry back in time. Anything carrying the ball of light or the unlit lantern, will take the lantern back in time when it’s placed onto it. Bridges you activate will consume the ball of light, and you won’t be able to reset the bridge when you go back in time. There’s a bell which lets flowers bloom or close its flower again, and there’s a mechanism which let you move certain objects separately from the timeline of the kids. Often the puzzles incorporate the objects on the island, for instance you’ll play a bit of a retro computer game in order to obtain the ball of light within the game shown on the TV screen on the island, and you’ll need figure out how to select the right file to print with the dot matrix printer on the island in order to spawn a new object on your path. This all sounds very confusing, but it’s not too hard to figure out in the game, since you’ll only have a few options to try out by turning time back and forth. Each group of islands introduces a new mechanism, which is usually quite easy to play around with on the first island, but gets more complicated as you progress because it will be combined with other mechanisms. Whenever a new mechanism is introduced, you’ll see quick instructions appear on screen, showing which buttons you’ll need to control that mechanism. You’ll be able to try anything at your own pace, since you can move the time around, you’ll be able to do anything you want at your own pace, do things over again to see their effects. The puzzles are really inventive, and challenging and fun to figure out. You’ll need to keep an eye on all the things moving around on the island, to see where everything is in relation to each other, and when they will interact with the balls of light you need. You won’t be able to move back over light-bridges and some other obstacles you passed, but whenever you’ve passed these, you’ve done all the right moves and there’s no need to turn back, you should instead look in the space you have for a solution. There’s no way to get stuck on the puzzles, so you’ll always be able to figure out a solution in the room you have to move around and manipulate time. 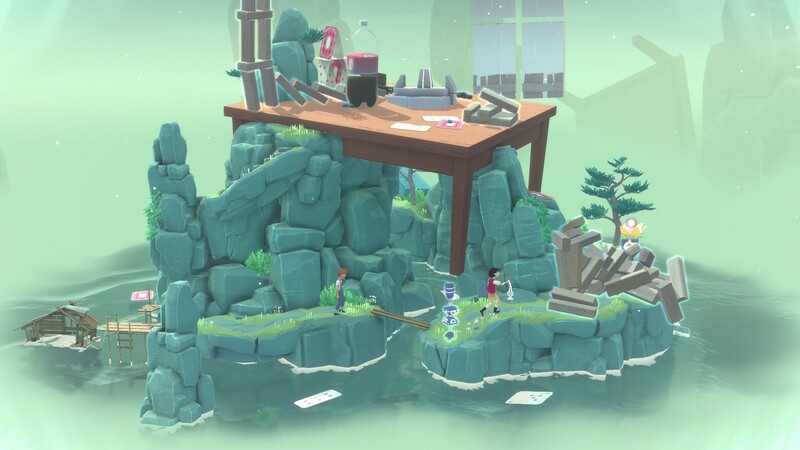 The Gardens Between is a really interesting puzzle game, with fun and innovative mechanics. The atmosphere of the game is very relaxing, and the story about the two children growing up together is nice and nostalgic. The graphics are colorful and pretty, and the soundtrack is very nice and dream-like. This game is recommended for people who like to play around with puzzle games, and who like relaxing games.